We love designing and building unique restaurant and bar furniture for our clients. We are the bespoke furniture specialists and enjoy taking someone’s vision, developing it and making it reality. It can be so satisfying to see their faces when the bespoke furniture is unveiled, and equally as exciting when the furniture is in situ and we see their diners’ faces. In this blog post, we’re going to highlight some of our favourite restaurant and bar furniture projects, in the hope that it will inspire you to dream big when it comes to your own furniture project. Our pieces are made by expert craftsmen so as well as looking stylish, they’re built to last. All three of the projects mentioned below involved working with the renowned designer Steve Howie, making his visions come to life. For this project, we created some funky seating from Steve Howie’s designs. Steve uses us regularly because he knows we deliver, we can make the impossible possible and the finished pieces are well made. We loved the contemporary quilted seating, which is Steve’s design called ‘Wavelight’. Our team of upholsters’ had to hand quilt every individual seat and back, and matching cylinder stools. The finished result is outstanding. The restaurateur for this project wanted seating that looking luxurious and wasn’t run of the mill. 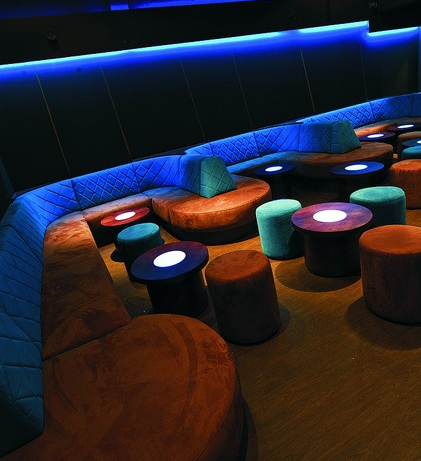 We produced bespoke deep buttoned seating, from Steve’s designs. The fabrics were perfect, complementing the restaurant’s décor. When you work with us, we have hundreds of amazing fabrics for you to choose from, and if you can’t see exactly what you want, we keep searching. This venue is like no other since its makeover, thanks to Steve’s imagination and our expert craftsmen. We built bespoke, shaped fixed seating with hand quilted back rests that would be both comfortable and stylish. We also created matching cylinder drinks tables with LED lighting and cylinder stools. This helped give the nightclub a VIP feel. To discuss your bespoke furniture project, give us a ring on 01925 419 121 or fill in our enquiry form. No project is too big or too small.